It’s either spicy or sweet. Mad or silly. Scary or happy. Sleepy time or wake up. Big kid or baby. Mommy or Daddy. To Leo, the world is composed of idiosyncratic pairings that he considers opposites. It brings to mind that rhyme about the little girl who had a little curl (right in the middle of her forehead): When she was good, she was very very good, but when she was mad she was horrid. Being around Leo, it’s tempting to try to fit things into a binary pattern the way he does. Yesterday, Leo was horrid. He got so upset when I wouldn’t let him climb our front gate that I couldn’t get him into the house for what felt like at least 10 minutes of public hysteria. Today, we had parent-teacher conferences. I watched Leo bully a friend out of the corner of my eye as the teacher went through her list of Leo’s emerging skills. All emerging, as in, not there yet. Then, on the way home, Leo was delightful. He walked up the stairs and into the house, washed his hands, helped with dinner, then played on the patio with his sandbox. While Aaron bathed him, I cleaned up the house. I had the vacuum running (darn sand!) and didn’t hear the tone shift. Apparently it all fell apart around the tooth brushing. 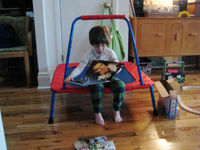 Leo told Aaron he didn’t want him to read stories, he wanted Mommy to do it. We were all a bit confused, since Daddy and Mommy usually call this particular shot, but in the end, we decided Daddy could do it another night, and Leo and I cozied up in his chair to read books in which Mommies comfort their children. It’s an interesting instinct to simplify the confusing world, to make things one thing or the other, and I am sure we still do it as adults. But of course we’ve learned, gradually and painfully, that most things are not that easy to understand. Toddlers especially. 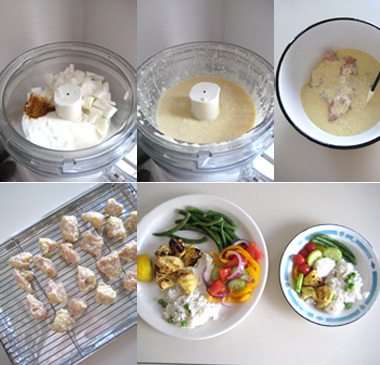 This afternoon I made Yogurt-Marinated Curried Chicken Breast, because Leo loved the idea of the chicken tikka we ordered in the other night, but in the end pronounced it spicy and had to drown his sorrows in yogurt. “This is sweet,” I told him (not technically true, but not spicy). “Please try it and let me know what you think, so I know whether I should make this for us again.” He tried it. “Can we have this again?” he asked. “Yes, do you like it?” I asked, jubilant. In reply, he shoved a whole chunk of chicken in his mouth, chewed, then crumpled with disappointment. “This is shpizhy!” he managed to say through a full mouth, before spitting it all into Aaron’s hand. So I don’t know, is it spicy? Sweet? Maybe you shouldn’t serve this if your kid hates flavor. But it’s quite mild. Anyway, I liked it. Is it a parent’s job to simplify the world for their kids? Or to model acceptance of life’s ambiguity and confusion? I am quite sure I don’t know, but my best would be something in between. And I do know that I can’t bear to eat thoroughly unseasoned chicken breast with white rice for dinner every night until Leo’s palate matures. I feel for the kid—it must be tiring having to face new foods every night, after a long day of new experiences. Not even the blandest chicken and rice can offer enough comfort to combat the challenges of living in this world. Can you blame him if he wants to retreat to his sleepy time room to re-read familiar stories with his Mommy?